The matcha green tea smoothie is a delicious and quick recipe. 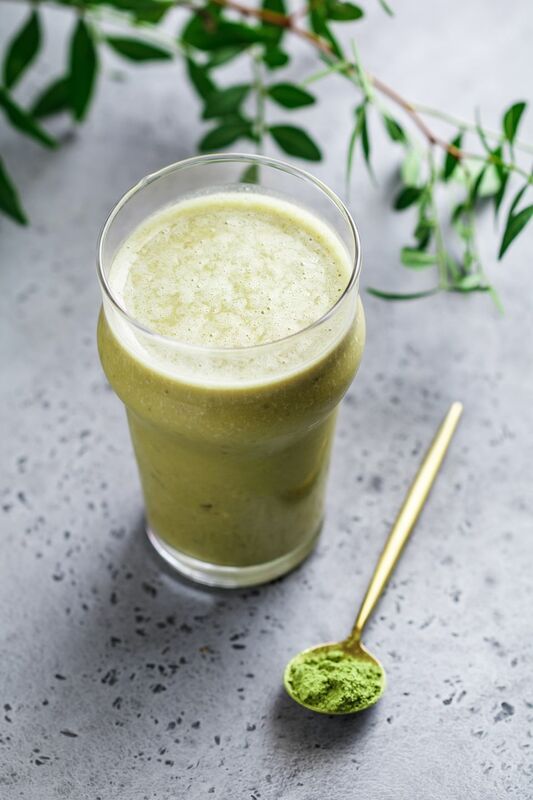 It is one of the most popular tea smoothies you'll find and thanks to the matcha powder, it has the fantastic taste of green tea with a hint of banana. Not only is this smoothie healthy and a fun, new way to drink your tea, it's also a great way to use bananas that are a little too ripe. In fact, the riper the banana, the better your smoothie will be because it will blend up quickly and has a great flavor that pairs well with the matcha. T​his recipe specifies the order to add the ingredients because the smoothie blends up easier if you add the matcha powder before the liquid ingredients. It is a powder, after all, and is prone to clumping. If you use a milk alternative, this green smoothie recipe is also vegan-friendly. It really is a fantastic smoothie for everyone and the unique flavor is sure to pique your taste buds. Combine the banana and matcha powder in a blender. Add the milk (or dairy alternative) along with the vanilla and sweetener, if you like. If you have tried to make matcha tea, you will certainly find that this smoothie recipe is much easier. There is a certain method of mixing the green tea powder and it can be a little tricky for beginners. If you are one of those who gave up on matcha, this is a great way to use up the leftovers. You'll find that matcha is best when it's fresh. This is not one of those ingredients that you want to buy in bulk. Instead, purchase only enough to last you for about three months. It's also good to try different matcha powders. Shop around and try a few in your favorite recipes until you find one that you really enjoy. You might also find 'green tea powder' in Asian markets and this is, essentially, matcha. As mentioned, your banana should be good and ripe for this (and any) smoothie. When your bananas hit that point when they're about to go brown, toss them in the freezer. Milk is good in this smoothie, but you might find that coconut milk (or even coconut cream) is just a little bit better. This adds an extra depth to the flavor and creates a nice blend in the banana and matcha. You can also find actual 'coconut milk creamer' that is designed for coffee. It comes in popular flavors like French vanilla and hazelnut as well. If you would like to sweeten this smoothie, it's best to do so with a liquid sweetener. Honey, simple syrup, or agave nectar are all good options. Add just a little at a time, starting out with about 1 teaspoon, depending on the sweetener you choose.